I was recently invited to try out a treatment at express beauty salon Mimi's Beauty Room, and I headed over to Sandymount village on Friday evening to have my first ever Minx Manicure. My first impressions of the salon were really positive: it's very slick and stylish, the girls were incredibly warm and welcoming and - always a plus - I was greeted with a very welcome glass of champagne. The salon incorporates four treatment rooms and a nail bar, and offers waxing, tanning, manicures, pedicures, eye lash and brow treatments and NovaLash semi permanent eyelash extensions. A range of beauty products and jewellery are also available to buy and I was quite taken with a crystal skull ring - maybe next time! They're clearly kept busy - there were lots of customers around while I was there - and the girls told me that Rockstar spray tans and Shellac manicures are hugely popular. I went for the 'Golden Lightning Cheetah' Minx design, which was expertly applied by Aisling. Unlike at home nail wraps I've tried, Minx products are heat activated and can last up to two weeks on fingers and considerably longer on your toes. The process takes around half an hour and usually costs €30, for hands or feet. Afterwards, I grabbed a cab and the (male) taxi driver waxed lyrical about Mimi's on the drive back to the city centre. He said the salon is a great addition to the area, the staff are lovely and it's great to see them doing so well. And I couldn't agree more. 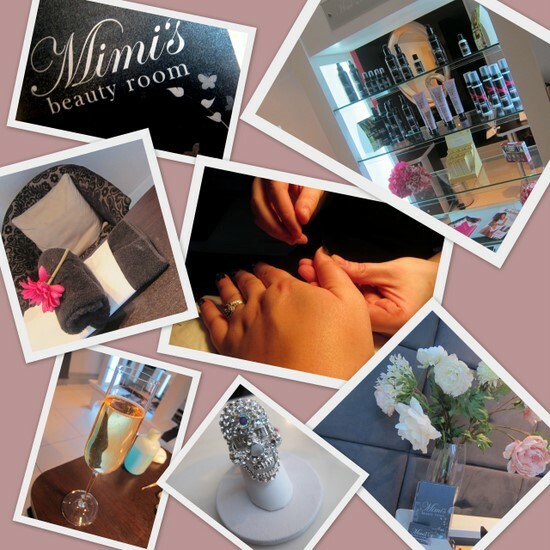 You'll find Mimi's Beauty Room at 6 Seafort Avenue, Sandymount, Dublin 4 and can reach them on 01-2071916. Love your Minx Mani, I got a Minx Pedi done when I was over in Brighton in the UK, loved it and it lasted really well. Thanks guys, I loved them! Your nails look amazing I am loving that leopard print and also that skull ring is hot! What a treat! Fab mani! Oh very fun! Your fingers look fabulous! And who can resist champagne? Seriously, how cute are you nails?! Love the nails. I am always so surprise with the design people come up with. this is probably one of my fave. Thanks for sharing. That looks fab, and sounds like a really fun experience. Bubbles and an awesome manicure - that's a darn good day. How fab! Gorge! I'm itching to try Minx - I'm thinking maybe toes in the summer. Loving your leopard print. Sounds like absolutely one divine day of pampering:) Being greeted with champagne...oh yes please! Your nails look lovely...it's so hard for me to keep anything on my nails...even just normal nail polish. I play piano...so anything I get done, always chips. I wouldn't mind trying something like this just to see if it would hold up for me. i love your nails, they're so cute!! I love Minx. It's hard to pick which to have. Too many choices! Love that mani! Oh God nothing is as great as getting your nails done. And when it's coupled with champagne, killer!